The following is an excerpt from 'The B.A. 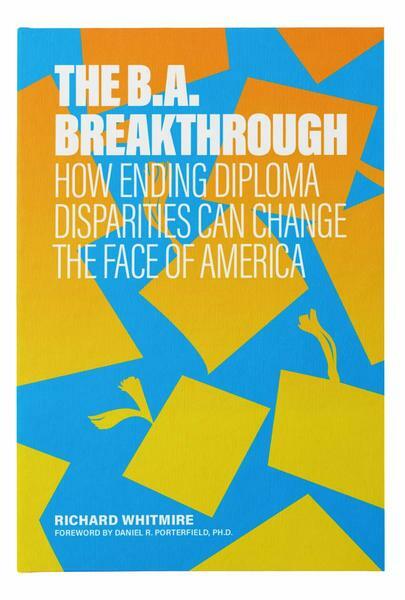 Breakthrough: How Ending Diploma Disparities Can Change the Face of America' by Richard Whitmire, available April 9 from The 74. To outsiders, the area around McAllen, Texas is best known for other reasons: It’s ground zero in the immigration wars. This is where Donald Trump wants to build the first part of his new border wall. It’s home to the country’s largest immigration detention center, the place where children infamously got separated from their parents. But there’s another story playing out here. McAllen is also home to IDEA Public Charter Schools, a fast-growing charter network with ambitions that extend far beyond providing good K-12 schools. IDEA wants to democratize higher education, making it routine for thousands of low-income Hispanic families in the Rio Grande Valley, who never before even considered college. Based on my visits there, they are well on their way. Today, when driving through the region, it’s not hard to spot billboards paid for by local school districts vowing that schools are all about “preparing students for college and careers.” That’s the impact IDEA has had in the Valley since 2000, said Garza. “Now, at all these districts, high school graduation alone is no longer the expectation.” That’s democratizing higher education. What this means on the ground is best viewed at the student level. Many middle-class suburban families might take one look at their stories and come to a quick judgment: These students are not college material. But that’s not how IDEA sees them, and now it’s not how the students see themselves. Consider Ricardo Murillo, whose parents were deported to Mexico when he was 11. At the time, they were living in Edinburg, just outside McAllen. His mother sold ice cream; his father did everything from cutting grass to working as a handyman. His entire family moved back to Mexico, but when he was 13, Murillo — the only one born in the U.S. — concluded his future was brighter in the United States and returned to Texas, living with cousins outside Edinburg. After spending a summer in Mexico with his parents, he went back to Texas to learn that his cousins were transferring to an IDEA charter, and therefore he had to as well. “I was pretty angry. IDEA was becoming a popular school, but it was not what I wanted. I thought it was a nerdy school.” What Murillo wanted was to stay at his traditional public school in Donna, where, by his own description, he was becoming a “baggy” — a term for gang members and their baggy clothes. But he had no choice, so he entered IDEA Alamo. There, his grades ranged from C’s to A’s, depending on the course. It wasn’t until his senior year that he even considered college, a must-do at IDEA. Murillo ended up at the University of Texas Rio Grande Valley in Edinburg, best described as a commuter university. It’s a choice embraced by many IDEA graduates, either because of middling grade point averages and test scores, a desire to live at home with family, or both. But UTRGV, as it is known locally, is a cut above the average commuter university. Torkelson sits on the board, and IDEA keeps two college counselors on campus just to guide its students. The college success rate there — 40 percent of the entering freshmen earn a bachelor’s degree within six years — is well below those of elite colleges and universities with success rates hitting the 90 percent mark. But that 40 percent is double what you find at many commuter universities, and IDEA’s involvement probably has a lot to do with that. Murillo still lives with a cousin, and he works at the homework center at an IDEA school, helping high school students with their studies. Despite his spotty record in middle school and high school, Murillo stepped it up in college, tackling a challenging electrical engineering major. He’s on track to graduate in five years. With Pell Grants and scholarships, he will owe only about $4,000 after leaving college. After graduation, he’s looking at two careers — taking a job at a robotics company or working as a school counselor at an IDEA school. “An assistant principal at IDEA Alamo said I would make a great counselor, telling students about my background, how I made it,” he said. Much like Murillo, when Reyes got to UTRGV he stepped it up, enrolling in the accounting program. He has nearly a 3.0 grade point average, and in the summer of 2018, he was only one course away from graduation. He will leave with about $8,000 in college debt. His goal: a master’s degree in accounting and a job as an accountant at a university. Both Murillo and Reyes represent what’s happening in the Rio Grande Valley, courtesy of IDEA charters. Yes, IDEA sends a fair number of its graduates to the more prestigious University of Texas at Austin and Texas A&M and a sprinkling to the Ivies and other top Eastern universities [my personal favorite: several years ago, when watching a raucous college signing day at a local arena, I saw Gilberto Gutierrez celebrate his acceptance at MIT. His mother works at an IDEA school cafeteria]. But that’s not really what democratization of higher education is all about. What democratization does mean is that over the past 12 years, as Garza points out, 100 percent of IDEA’s students have been accepted to colleges, and all but four have gone, thanks in part to universities such as UTRGV. The question to ask, of course, is: Are they successful? Do they earn degrees? Over those 12 years, roughly 44 percent of IDEA graduates ended up with bachelor’s degrees. For comparison purposes, roughly 11 percent of low-income students do the same. Even more interesting: Like other charter networks, IDEA tracks its graduates by cohorts. For the more recent Class of 2012, the projection shows that 55 percent are on track to earn a bachelor’s within six years, the highest in the network’s history. Should IDEA worry that so many of its graduates end up at UTRGV? That question gets at the heart of what democratization of education means. Garza loves to cite the number of graduates who go off to prestigious colleges, where the likelihood of earning degrees is near certainty. But he also knows his IDEA families, who struggle with financial issues and grapple even more with seeing any of their children leave town. “College is an academic decision, but it’s also a fiscal decision and a social decision,” said Garza. “We are in the business of ‘me power’ … We want to give families choices.” And if they choose to stay close to home and graduate nearly debt-free, so be it. It was an informed choice. IDEA’s push for the democratization of higher education extends to gathering up students who “stopped out” of college and want another shot. In what is called IDEA-U, students sign up for the online curriculum offered by College for America at Southern New Hampshire University. But instead of a problematic do-it-alone-at-home online program, IDEA-U offers an actual classroom building complete with a tutor/ counselor. Not only can the students escape home distractions, but they have the kind of education technology, including computers, that aren’t found in their homes. The tuition is $5,500 a year, which matches a Pell Grant, and IDEA predicts that most of its students will complete an associate’s degree in eight to 14 months. IDEA-U opened in 2017 with 100 students. The goal: 6,000 students in six years with multiple centers. A fanciful goal, perhaps, for anyone other than IDEA, but this is the fastest-growing charter network in the country, and it has always met its expansion plan. Currently, IDEA has 79 schools with 48,000 students and aims to have 100,000 students in 200 schools by the year 2022. IDEA offers an insight into Phase Two of The B.A. Breakthrough. Phase One was the push to do right by students who are talented but poor, those who graduate at the top of their high school classes, test well, but rarely make it to a college that’s their equal, a college from which they are likely to graduate. The Jack Kent Cooke Foundation, which seeks out these students for scholarships, estimates there are 3.4 million high-ability, low-income students in grades K-12. That’s a lot, and the foundation deserves thanks for its pioneering work. But all those talented kids have siblings and neighborhood friends who attend school with them. Reaching all “ The coaches and the academic center offer a sense of belonging, a sense that you do matter — a sentiment these students rarely feel those students and finding a college pathway for all of them, not just the very brightest, is what IDEA and other charters do. That’s Phase Two of the Breakthrough. Nobody believed Tom Torkelson and JoAnn Gama when they opened their first charter and promised college for all. Not only have they done that with their own alumni, but they forced the traditional school districts in the region to pursue the same college-for-all goal. The Rio Grande Valley is not the only place in the United States where the democratization movement is playing out. California is a close runner-up. But the Rio Grande Valley may be the only place where you can read all about it on billboards. Richard Whitmire is the author of 'The Founders', published by The 74, 'On the Rocketship: How Top Charter Schools Are Pushing the Envelope' and 'The Bee Eater: Michelle Rhee Takes On the Nation’s Worst School District'. 'The B.A. Breakthrough' will be published on April 9 by The 74.